The new Markel Center at Virginia Commonwealth University’s Institute for Contemporary Art (ICA) in Richmond has completed. The ICA uses fashionable folding geometry that has become popular in this age of parametric design. The arts school maintain that both the VCU and the city needed a contemporary art institution. The university needed it to stand out as a creative campus. The building is clad in pre-weathered titanium zinc and etched glass. Designed by architect Steven Holl, the multidisciplinary arts institution will serve as a catalyst for exhibitions, programs, research and collaboration, working with VCUarts, the top public university graduate arts and design program in the U.S.
Richmond, VA – September 11, 2012 – Virginia Commonwealth University announced today that it has surpassed the $20 million mark in support of the university’s new Institute for Contemporary Art; raising an additional $6 million towards its $32 million campaign goal since unveiling the building’s design in April 2012. Part exhibition and performance space, part lab and incubator, the ICA will feature a series of flexible programming spaces for the presentation of visual art, theater, music, dance and film by nationally and internationally recognized artists. The gifts noted above, along with additional gifts from individuals and corporations, bring the total raised to-date to more than $20 million. Currently anticipated to open in 2015, the ICA will be a non-collecting institution designed to facilitate the way artists are working today by accommodating the increasing lack of barriers among different media and practices, mirroring the cross-disciplinary approach at the VCU School of the Arts. VCUarts is one of the nation’s leading arts schools, with distinguished alumni and noted artists at campuses in Richmond and Qatar, and has long been the top public university graduate arts and design program in the country according to U.S. News & World Report. VCU is also home to the Anderson Gallery, which for 35 years has organized and presented exhibitions, programs and publications that explore a broad range of currents in contemporary art and design. 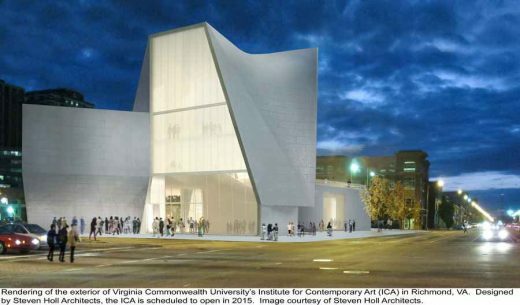 The ICA will complement and enhance the offerings of VCU while also serving as a new destination for contemporary arts and culture in the region and a cornerstone of Richmond’s already vibrant arts community — joining the Virginia Museum of Fine Arts, the Science Museum of Virginia, the Virginia Opera, Virginia Repertory Theatre, Richmond Ballet and the Richmond Symphony. Institute for Contemporary Art Will Serve as a Catalyst for Exhibitions, Programs, Research and Collaboration, Working With VCUarts Top Public University Graduate Arts & Design Program in the U.S.
Richmond, VA – April 25, 2012 – Virginia Commonwealth University (VCU) today unveiled the design for a new Institute for Contemporary Art (ICA) designed by Steven Holl and Chris McVoy. Part exhibition and performance space, part lab and incubator, the 38,000-square-foot building will feature a series of flexible programming spaces for the presentation of visual art, theater, music, dance and film by nationally and internationally recognized artists. The facility also encompasses a 240-plus seat performance space, outdoor plazas, a sculpture garden, classrooms, a café and administrative offices. 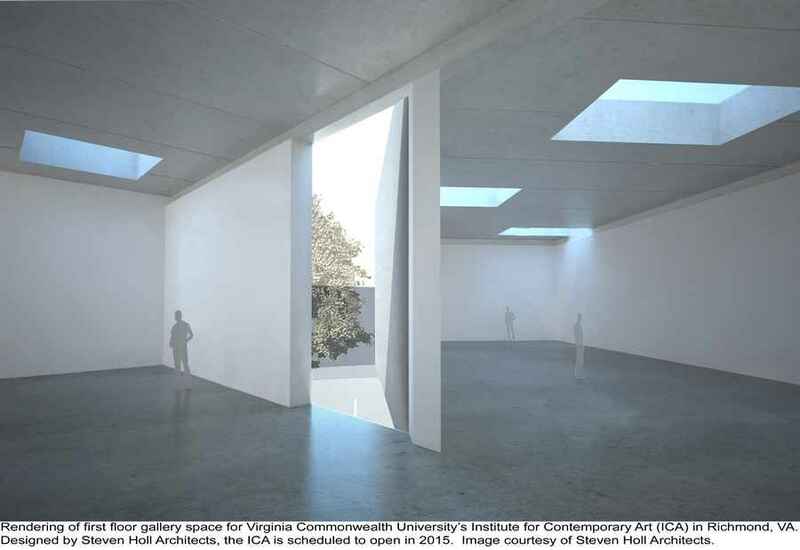 Scheduled to open in 2015, this non-collecting institution is designed to facilitate the way artists are working today by accommodating the increasing lack of barriers among different media and practices, mirroring the cross-disciplinary approach at VCU’s School of the Arts (VCUarts). VCUarts has long been the top public university graduate arts and design program in the country, according to U.S. News & World Report. The ICA will complement and enhance the offerings of VCU while also serving as a new destination for contemporary arts and culture in the region. 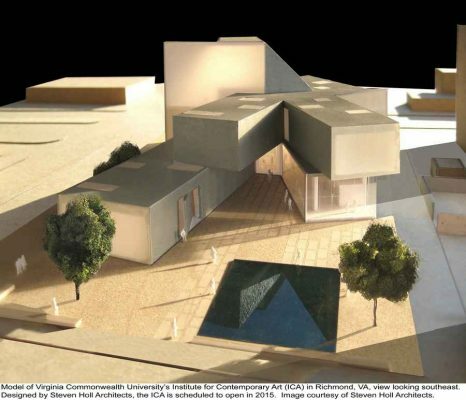 Steven Holl Architects’ design for the ICA will be presented in an exhibition opening April 26 at New York’s Meulensteen gallery. “Forking Time” includes more than 30 study models and concept drawings that depict the design’s evolution. Sited at the corner of Belvidere and Broad Streets directly off of Interstate 95, and one of Richmond’s busiest intersections, the ICA will form a gateway to the University and the city. 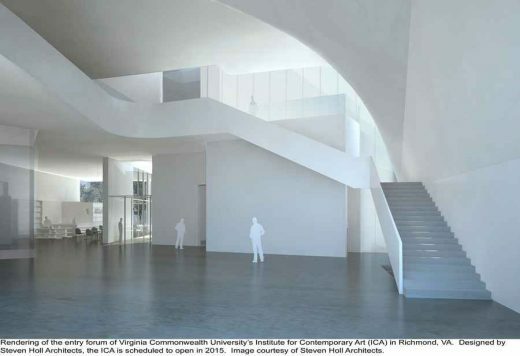 The ICA will feature dual entrances—one facing Richmond and the other fronting VCU’s campus. At the heart of the building will be an inviting, double-height “forum,” a flexible space for both spontaneous encounters and planned events that connects to the ground-floor performance space and also opens to the sculpture garden and cafe. The galleries radiate out from the forum in forked arms, shaping the space of the garden. Large pivot doors open to the garden in order to create a seamless interplay between interior and exterior spaces. The open circulation serves to remove the formal protocols associated with entering traditional arts facilities. The three levels of galleries are linked through the open forum, allowing artists to create works that extend across, and visitors to circulate through, the spaces via a variety of paths. The ICA’s exterior walls of pre-weathered satin-finish zinc will complement its urban setting. Additional clear and translucent glass walls will create transparency, bringing natural light into the building during the day and radiating light at night, signaling the activities taking place within. In advancement of VCU’s commitment to science, technology, and environmental responsibility, the ICA’s design incorporates many environmentally-friendly elements, making use of natural resources whenever possible. This includes the use of geothermal wells to provide heating and cooling energy for the building, green roofs to absorb storm water and maximize insulation, and glass walls designed to exhaust heat in the summer and harness it in the winter. The project is designed to meet LEED platinum certification standards. BCWH is the architect of record in Richmond. 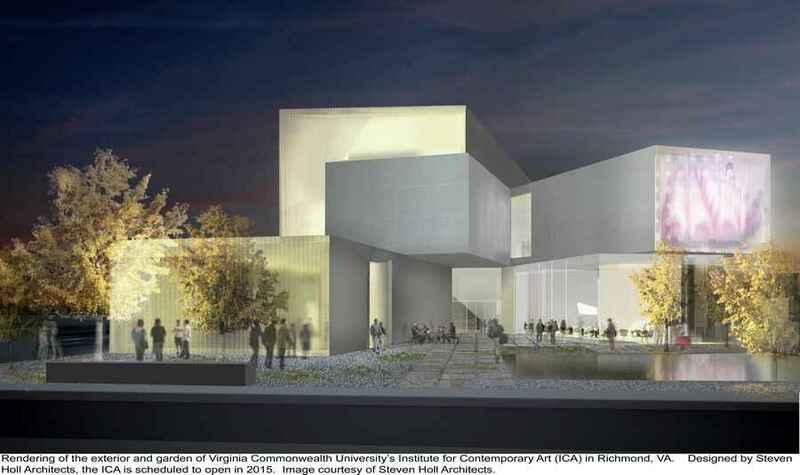 The ICA will serve as a cornerstone of Richmond’s already vibrant arts community, joining the Virginia Museum of Fine Arts, the Science Museum of Virginia, the Virginia Opera, Barksdale Theatre, Richmond Ballet and the Richmond Symphony. VCUarts is one of the nation’s leading arts schools, with distinguished alumni and noted artists on faculty across its more than 16 areas of study at campuses in Richmond and Qatar. VCU is also home to the Anderson Gallery, which for 35 years has organized and presented exhibitions, programs and publications that explore a broad range of currents in contemporary art and design. A capital campaign is underway for the $32 million project, with $14 million raised to date, including two lead gifts of $5M apiece from Kathie and Steve Markel and Pam and Bill Royall, who together chair the ICA’s Campaign Committee. A director search is in process. Virginia Commonwealth University is a major, urban public research university with national and international rankings in sponsored research. Located on two downtown campuses in Richmond and a satellite campus in Qatar, VCU enrolls more than 31,000 students in 216 certificate and degree programs in the arts, sciences and humanities. With a distinguished faculty of professional artists and 16 departments, including Craft/Material Studies, Fashion Design and Merchandising, Dance and Choreography, Graphic Design, Music, Painting and Printmaking, Photography and Film, Sculpture + Extended Media and Theatre, VCUarts has been the top ranked public university visual arts and design graduate program in the country for nine years, according to U.S. News & World Report. Its campus in Qatar provides students and faculty with a direct tie to the Middle East, a region of increasing significance in the contemporary art world.